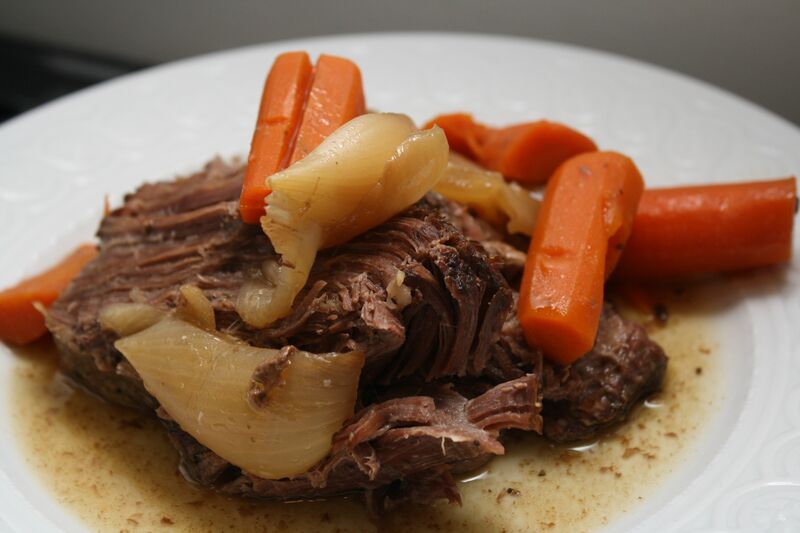 Just as I was skeptical of the Slow Cooker Beef Stew recipe that did not require me to brown the stew cubes, I was highly skeptical of this slow-cooker pot roast recipe that did not require me to brow the chuck roast and called for very little liquid. Adding to my skepticism was the fact that the only seasoning was salt, pepper, and 2 tablespoons of Worcestershire sauce. Well, I guess those folks at Everyday Food know a bit more about slow cooking than I do! The pot roast was incredibly tender, the carrots and onions were infused with flavor, and there was a ton of “jus”. As an added time save you can use baby carrots — no peeling needed! Be sure to trim the roast of excess fat — the sauce will be better! 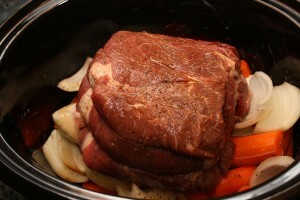 I cooked the pot roast on low for 11 hours because my piece of meat (from our half-steer) was closer to 4 pounds than the 3 pounds in the recipe. Lastly, I might add an additional tablespoon of Worcestershire sauce next time for some added oomph! But the recipe was (somewhat surprisingly) delicious as written! Brrr….it is frigid in New York City! 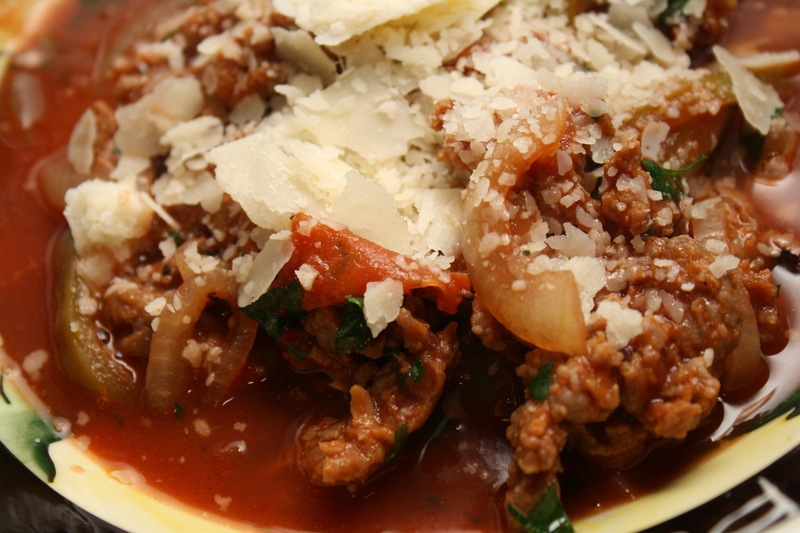 Here is a great stoup recipe to keep warm on a cold night. Rachael Ray uses the word stoup to refer to a dish that is heartier than a soup but not quite a stew. As is the case with all of her recipes, a stoup typically comes together in 30 minutes. I love sausage and peppers! And, this recipe allowed me to enjoy the delicious taste of slow cooked sausage and peppers without all the work. The dish came together, with minimal chopping, in about 20 minutes. Of course, since I love a little heat, I used hot Italian sausage. But, I am sure it would be tasty with sweet or mild sausage. The store didn’t have bulk sausage so I just bought links and removed the casings. I opted for crushed tomatoes over diced. And, I used three large peppers. Four peppers might have been too much. YUM-O! Make sure to have some crusty bread for dipping! As an aside, do you know the actual definition of stoup? 3. Scots A bucket or pail. Heat extra-virgin olive oil in deep skillet, add sausage and brown a few minutes then add garlic, peppers, onions and cook until soft, 6 to 7 minutes more. Looking for a tasty weeknight chicken recipe? 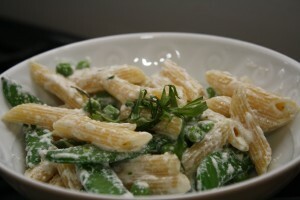 Here another delicious recipe from my gal Giada. What I love about this dish is that it tastes like it has been simmering for hours but only requires about 30 minutes of prep and cooking. The prosciutto, wine, chicken stock, and peppers come together to make a delicious sauce worthy of a piece of crusty bread! The chicken was super moist and flavorful. Tim and I are trying to go low carb these days but I could imagine serving the chicken with some polenta for a delicious meal. 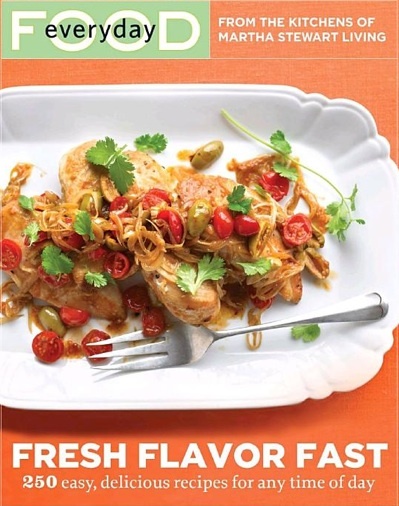 Here is another recipe I found while shopping for groceries on Fresh Direct. As I try to find time to prepare dinner with a newborn, I’ve been looking for recipes that are quick and healthy (so I can lose the baby weight). This recipe — requiring little prep work and using ground turkey — fit the bill. I’ve never made tacos with tomato sauce as an ingredient — it imparts some sweetness to the dish reminding me vaguely of Sloppy Joe’s. There is definitely some heat from the chili powder, cumin and paprika. I served the tacos with lettuce, chopped tomatoes, and shredded cheese. 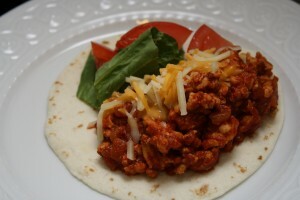 This is definitely a tasty alternative to my typical beef tacos! In a large skillet over medium-high heat, add oil. Sauté the onion for 5 to 8 minutes, or until softened. Add garlic and sauté for 1 minute. Add turkey and cook for 6 to 8 minutes, stirring frequently to break it up. Add tomato sauce, chili powder, cumin, and paprika and stir well to combine. Reduce the heat to low and cook for 8 to 10 minutes, stirring occasionally. Season with hot sauce, salt, and pepper. Meanwhile, wrap the tortillas in a damp paper towel and warm in the microwave on HIGH for 15 to 30 seconds. When ready to serve, place toppings in small bowls on the table. Layer about 1/3 cup of turkey in a tortilla and add desired toppings. 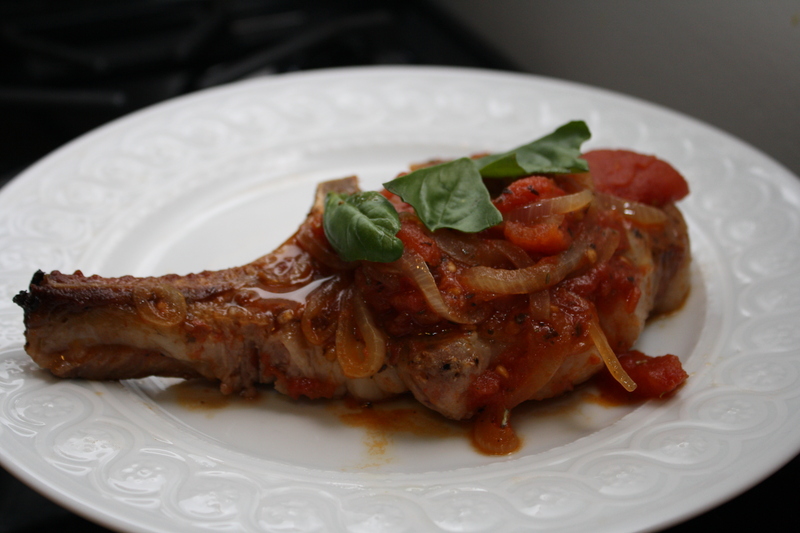 Here is a delicious way to prepare your basic pork chop, courtesy of Giada de Laurentiis. I bought some delicious center cut pork chops at the butcher shop in Chelsea Market. We were thinking of grilling them but then I came upon this recipe. With the tomatoes, onions, red pepper flakes, and herbes de Provence, it looked right up my alley. The dish was quick and easy to prepare and packed with flavor! You likely have all the ingredients in your kitchen. I actually didn’t have any diced tomatoes but I just chopped up a can of whole tomatoes. Make sure to serve with some crusty bread to mop up the extra sauce! 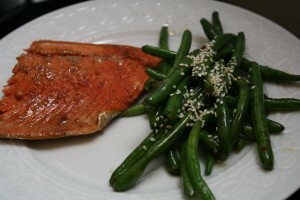 Tim and I both loved the meal — will definitely be making this again. Place 1 pork chop on each plate. Spoon the sauce over the pork chops. Sprinkle with the parsley and serve. Here’s another super easy meatless Monday recipe — courtesy of the new Everyday Food cookbook — that relies on spring produce. The thing I love about this recipe is that other than chopping a tablespoon of fresh tarragon there is absolutely no chopping involved! Perfect for a hectic weeknight (or for a gal who is nearly 41 weeks pregnant)! A couple of very minor notes…I used penne because I had half a box in the pantry. And, I also added 1/4 cup of grated parmesan cheese to the dish. Because of the naturally salty flavor of the parmesan I didn’t really add any extra salt to the dish (other than salting the boiling water). 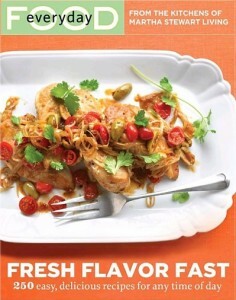 Our dinner was fresh, fast, and flavorful just like the cookbook title! Bring a pot of water to a boil; add a generous amount of salt. Cook pasta until al dente according to package instructions, adding snap peas 3 minutes before the end and frozen peas in the last minute of cooking. Reserve 1/2 cup pasta water; drain pasta and vegetables, and return them to pot. Toss pasta and vegetables with butter, tarragon, and ricotta, adding enough reserved pasta water to create a thin sauce that coats the pasta. Season with salt and pepper. To serve, divide pasta among shallow bowls, and garnish with tarragon sprigs. First of all, my mother thinks it is ridiculous that I am still cooking with my due date only five days away but I really do find cooking (and blogging) relaxing. I bought the new Everyday Food cookbook a few weeks ago and have been thinking that the cover recipe looked quite tasty. It didn’t require too many ingredients or much prep work so I thought I could handle making it tonight. My only note on the recipe is that the chicken breasts I used were rather thick so it probably took 20 minutes for them to be cooked through. 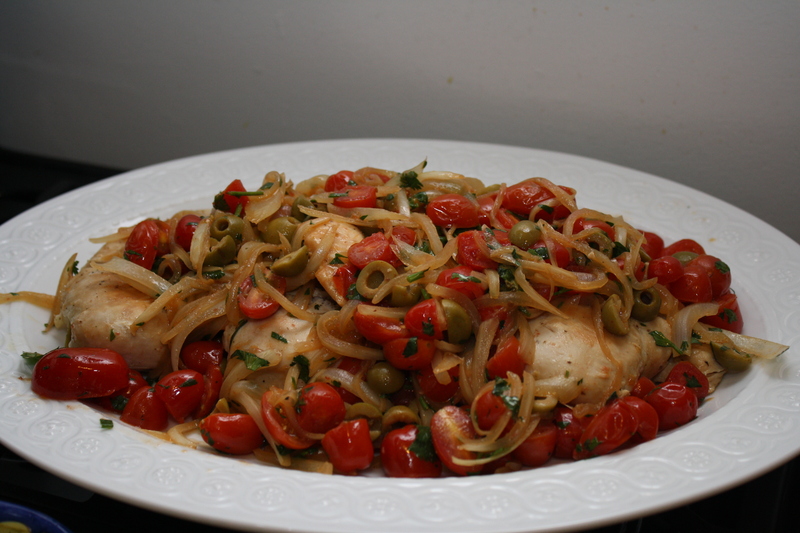 Tim and I both loved the tomato, olive, and onion mixture on top of the chicken. The lime juice and cilantro provide a nice, fresh flavor as well. 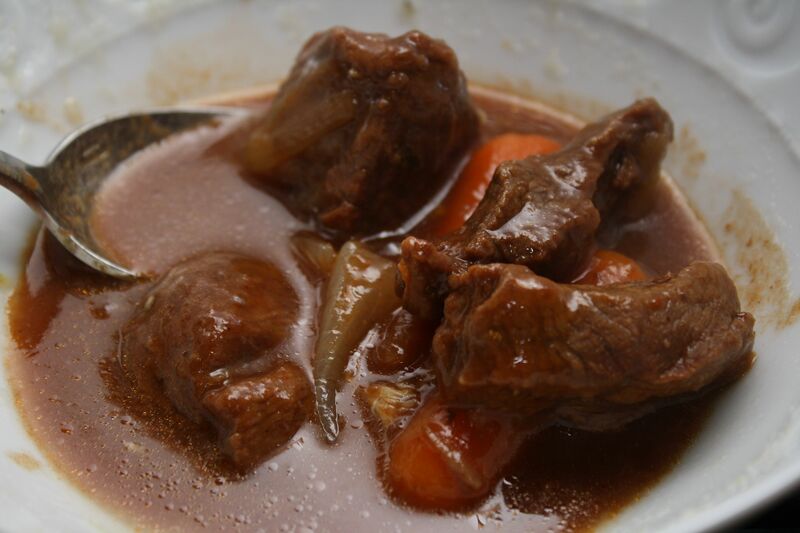 The recipe suggested serving with rice or crusty bread and salad. I opted for some crusty bread because I didn’t want to dirty another pot. I piled some of the extra tomato mixture on top of the bread. Yum! Overall, a simple weeknight recipe that spices up your basic chicken breast. In a large skillet, heat oil over medium-low. Season chicken on both sides with salt and pepper, and cook until lightly browned and just cooked through, turning once, 10 to 15 minutes. Transfer to a plate; cover loosely with aluminum foil. Raise heat to medium; cook onion, stirring occasionally, until softened, 5 to 7 minutes. Add tomatoes and olives; cook until tomatoes soften and release their juice, 1 to 2 minutes. Remove from heat, and stir in lime juice and cilantro. Season with salt and pepper. 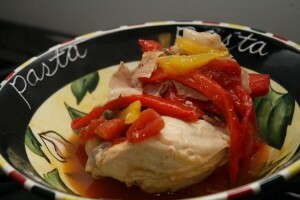 Serve chicken topped with tomato mixture. Tim and I had a very long week moving our AdBuyer.com offices from shared office space in Tribeca to our very own space in the Flatiron. We were planning to drive up to the Berkshires Friday night but were too tired so we drove up Saturday morning. On our way up we decided to stop at Trader Joe’s in Danbury. We made the decision to stop about 200 yards before the exit so I had to come up with dinner menus for Saturday and Sunday in about 3 minutes. 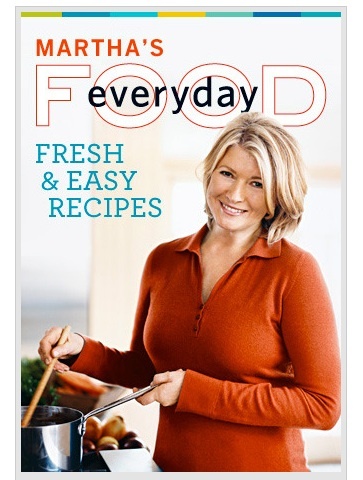 I had just installed the new Martha Stewart Everyday Food iPhone app on my phone so I decided to give it a whirl! Everyday Food’s recipes typically don’t have too many ingredients which was ideal — my shopping wouldn’t take too long and, hopefully, I’d be able to find everything I needed at Trader Joe’s. This Pepper Steak recipe — an au poivre-style dish, not an Asian pepper steak — was yesterday’s daily recipe. I thought Tim would really like it and Trader Joe’s typically has prepped butternut squash so I thought the recipe would be quick and easy in terms of prep time. I used a tri tip roast that Trader Joe’s had and followed the cooking instructions on the package. I cooked it longer and at a lower temperature (425 degrees) than the recipe below. The veggies still roasted beautifully. It was a very tasty one-pot, low prep dinner! Preheat oven to 475 degrees. In an 11-by-15- by-2 3/4-inch roasting pan, combine mushrooms, squash, and onion. Add 1 tablespoon oil and 3/4 teaspoon salt; toss to coat. Arrange vegetables around sides of pan; place steak in center of pan. In a small bowl, stir together mustard and peppercorns. Coat steak with the remaining 1 1/2 teaspoons oil, and sprinkle generously with salt. Spread mustard-pepper mixture over top of steak; press down to adhere. Roast, turning and stirring vegetables once, until steak is lightly browned and an instant-read thermometer inserted in one side of steak registers 130 degrees to 135 degrees for medium-rare, 15 to 20 minutes. Transfer steak to a cutting board to rest; tent loosely with aluminum foil. Spread vegetables in an even layer, return to oven, and continue roasting until lightly browned and tender, 8 to 10 minutes. Cut the steak into 1/4-inch thick slices, and serve with vegetables.